BUFFALO, N.Y. -- University at Buffalo running back Emmanuel Reed has been named to the preseason watch list for the Doak Walker Award – given annually to the top running back in college football. Reed is one of 62 players nationally and one of six from the Mid-American Conference named to the list. Reed had a breakout season for the Bulls in 2017. The Florida native started the final nine games of the year and led the Bulls in rushing with 840 yards and nine touchdowns. Reed had five 100-yard games in 2017, including a 144-yard, three-touchdown performance against Kent State which earned him MAC East Player of the Week honors. 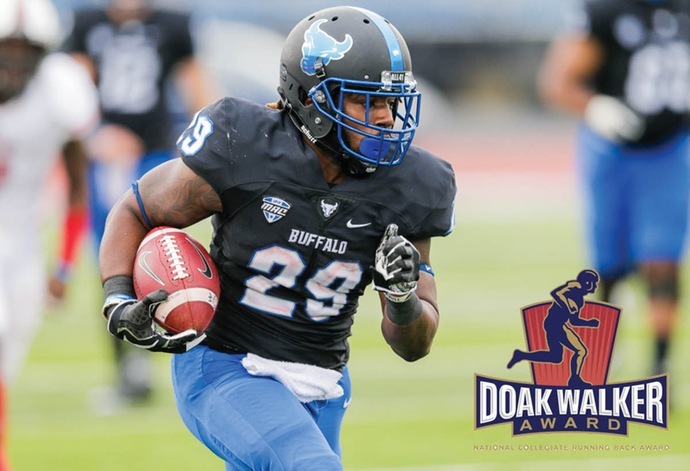 The award, which will name its 29th recipient in 2018, is named for SMU's three-time All-America running back Doak Walker. It is the only major collegiate award that requires all candidates to be in good academic standing and on schedule to graduate within one year of other students of the same classification.